Roberto Plumbing & Heating Inc. offers installation, service and repair of cooling systems, including central air-conditioning systems and mini-split heat pumps through our Hudson Valley Mini-Splits division. We can also customize your heating or cooling system using a combination of methods and multiple zones to give you the most cost effective and energy efficient heating and cooling systems possible. With a central air conditioning system the evaporator, condenser, and compressor are all located in one place, usually placed on a roof or next to the house or building’s foundation. Air supply and return ducts come from indoors through the home’s exterior wall or roof to connect with the air conditioning unit located outside. A central air conditioning system is much more efficient than the type of air conditioner you have to go through the hassle of putting in the window each year. In addition to being a more efficient method of cooling, they don’t get in the way like a window unit can (which can also be a safety hazard), and they’re much quieter and easy to operate. Today’s high-efficiency central air conditioners use only about half the energy to operate than models made in previous years. If your current system is more than 10 years old, you could see energy savings of 20%–40% by replacing your current A/C system with a newer, more efficient model. Hudson Valley Mini-Splits, the division of Roberto Plumbing & Heating, Inc. that specializes in mini-split heat pumps can install the perfect system for you! Mini-splits are a great energy-efficient choice for any home or office – whether a new build or older construction. Because there is no ductwork required, mini-splits can be used for cooling and heating in areas where it is not feasible or cost-effective to install ductwork such as additions, older homes that don’t have the room for ductwork, city-area apartments or offices where room is also a factor, or smaller homes and spaces where a large heating/cooling system is not necessary. They are also compatible with other existing non-ducted heating systems such as hot-water-baseboard or radiant, providing cooling in the summer months and either main, supplemental or backup heat in the winter months. ENERGY STAR certified heat pumps have higher seasonal energy efficiency ratio (SEER) and energy efficiency ratio (EER) ratings, as well as a higher heating seasonal performance factor (HSPF) than standard models, making them about 9% percent more efficient than standard new models and 20% more efficient then what you may have in your home. This adds up to big cash savings over time. 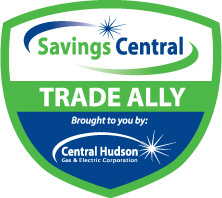 We are proud to be a Central Hudson Savings Central Trade Ally – ask about available rebate programs of as much as $500 on qualifying models!